The story of the Red Lion Hotel & Conference Center begins with sweeping vistas across shimmering Capitol Lake, and the serene forests around it. From the hotel’s hilltop perch, just beyond the water you can catch glimpses of the bustling shops and dining hotspots of Downtown Olympia, all neatly hemmed in by the stately buildings of the Capitol Campus. In other words, it’s the opportunity to immerse yourself in the lifestyle of a secluded, high-quality resort while still being within a walk of the city. It was those hilltop views, and the proximity to downtown and the Capitol Building, that nearly 50 years ago drew developers to built the Greenwood Inn on the site as part of the expansion of the West Olympia neighborhood. Remembers Red Lion night manager Bill Davies, who has worked at the hotel for 25 years, in the early days when the city was growing quickly lodgings were indeed lacking on that side of town. Soon, the 12 forested acres had been gracefully landscaped around the spacious hotel’s 192 rooms and suites. With its outdoor pool and hot tub, 16,500 square feet of meeting space, banquet facilities that could accommodate parties of up to 700 guests, and the airy Water View Restaurant and Lounge overlooking the lake, the Greenwood Inn was soon “The Place to Stay” in Washington state’s capital city. Davies, whose first hours of work at the hotel in 1991 started with the Inauguration Day windstorm that knocked out all the power in Thurston County, said that life at the hotel has always been just as exciting. Throughout its five decades, the Greenwood Inn was eventually picked up by the Holiday Inn brand, then bought out by Spokane-based Goodale & Barbieri real estate development company as part of its Cavanaugh’s group, and then rebranded with those properties to a WestCoast Hotel in 1999. It finally became a Red Lion in 2003, after WestCoast Hotels purchased that Vancouver, WA-based company. The Red Lion continues its legend as the place to be, according to tourists and business travelers who comprise the hotel’s sizable repeat-guest market. 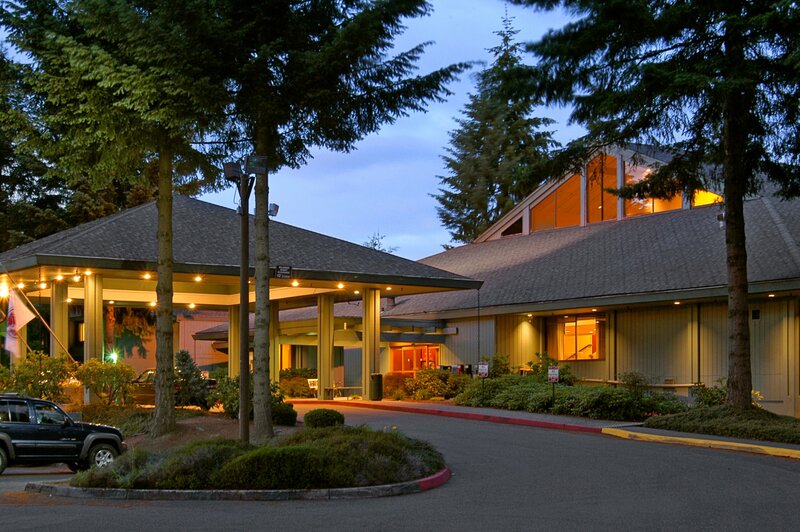 Next to the lake vistas, the vast events space is its second hallmark: The hotel has more meeting and convention square footage than anywhere else in the Olympia area, and it’s the only full-service hotel with a restaurant and on-site catering capabilities. Speaking of meals, catering is one area that the hotel has continued to develop and refine, especially in recent years. Besides for large events and meetings, the hotel — and its lush lawns and backyard gazebo with views over Capitol Lake — is a popular wedding site, where families can stage the entire event from the prior night’s dinner through the ceremony, reception party and honeymoon lodging. One Red Lion employee who’s particularly excited about the events opportunities embraced by the hotel is catering director Ann Sweeney. Besides weddings, Sweeney is also in charge of overseeing and catering a swathe of gatherings that range from local business lunches around a la carte soup and sandwiches, and Halloween bash nachos and hot dogs at midnight, to 600-guest formal military balls, massive Legislative session meetings, and the 500-guest Governor’s Prayer Breakfast. Some days, even with 16,500 square footage of space, she said that it doesn’t seem there’s enough room for everything. That’s the whole idea behind the business of the Red Lion Olympia: Working with guests to create an experience that’s successful, no matter what the request. Currently the hotel is pushing forward on that motive on an even greater level, with recent renovations to lobby furnishings, fresh carpeting throughout, a new, free downtown shuttle service, and much more in the works with its new branding to improve the guest and event-goer experience. There’s even a new logo to mark the company’s dedication to providing higher quality service and amenities in coming years. “When our guests walk in, we want them to feel at home. And when they walk out, we want them to feel nothing less than rejuvenated and excited for a return trip,” emphasized Bowe. “It&apos;s our responsibility to make sure they have that experience, and it starts with customer service. We make sure that when they come through the door that our hospitality team is ready to serve them — at every point in the hotel from the front desk to the housekeeping to the restaurant. And it seems that the team at the Red Lion isn’t just ready to serve; they’re also happy and willing to do so. That includes Bill Davies, who after 25 years said that he has never tired of his job. And there hasn’t been a single day that he hasn’t wanted to be there.